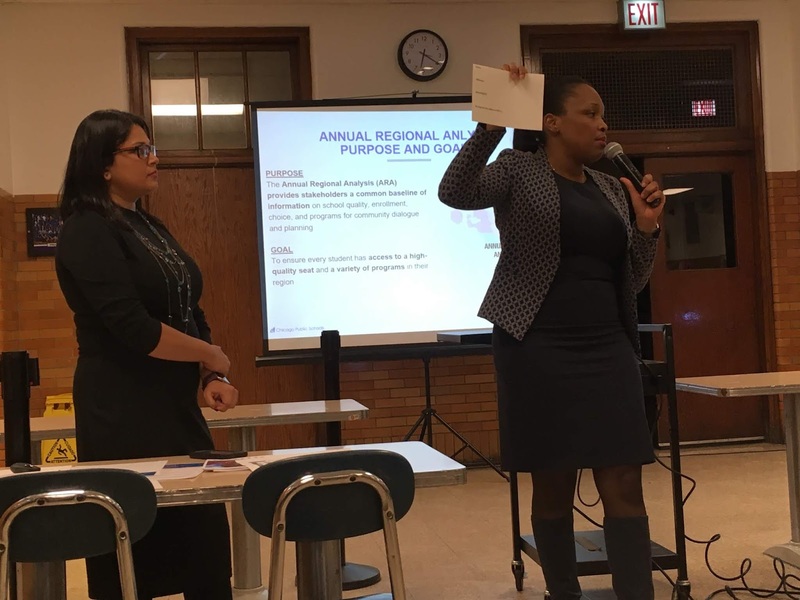 Chicago Public Schools career-office director Rita Raichoudhuri and CEO Janice Jackson present the report at Wells High School, 936 N. Ashland Ave.
A Chicago Public Schools study suggests that more than elsewhere in the district, families here reject local schools for top-tier alternatives nearby. The Mid-North Side region has lost 13% of its student population in four years, according to a Nov. 15 presentation by Chicago Public Schools CEO Janice Jackson at Wells High School, 936 N. Ashland Ave. High schools are half-full; 58% of high school students travel outside the region, and only 16% attend their designated neighborhood school. Turnarounds are a challenge when more families are leaving the city than are moving in, Jackson admitted. Combined with birth-rate trends, she expects Miami-Dade County to overtake Chicago as the third-largest public school district. With state funding still tenuous, Jackson says long-term capital plans will require a stronger fiscal footing. 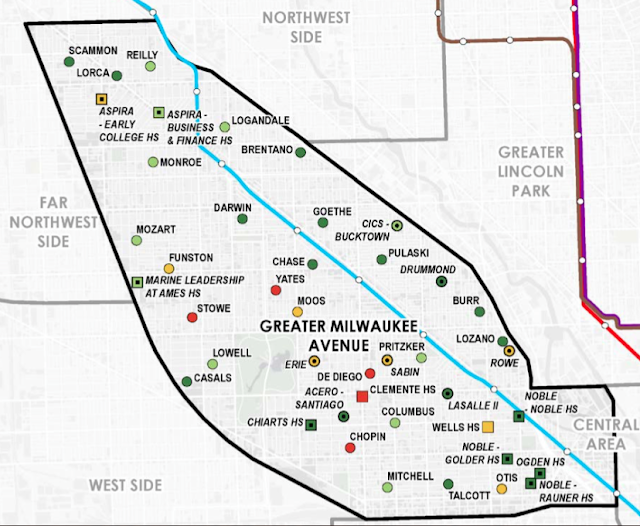 Schools in the Greater Milwaukee Avenue region, with Level 1-plus locations in dark green and Level 1 in green. Wells High School, nominally the school for East Village, has an official enrollment of 363. Its performance is rated at Level 2, a CPS middle-tier rating based on test scores, academic growth, school culture and other measures. Ogden International School, 1250 W. Erie St., is a Level 1 high school, while Clemente scores at Level 2. One-third the high schoolers not in their neighborhood schools attend charter schools like Golder, 1454 W. Superior St., and Rauner, 1337 W. Ohio St., both Level 1-plus schools. Elementary schools have more high-performing choices in the Greater Milwaukee Avenue region. As a result, they're at 71% capacity. Half the students in their attendance-zone school. LaSalle II, the selective enrollment elementary school at 1148 N. Honore St., is in the district's Level 1-plus top tier, as is Pritzker School at 2009 W. Schiller. Pritzker enrollment is at 726; 589 attend LaSalle II. Among neighborhood schools, Mitchell, at 2233 W. Ohio St., is a Tier 1 school, while Talcott, 1840 W. Ohio, is Level 2-plus; Otis at 525 N. Armour St. is Level 2. The region has a less diverse choice of special programs, with 24% of seats incorporating world language programs but none with science, tech, engineering or math specialties. At high school level, 15% of seats offer career and technical tracks. The briefing suggested that capacity measurements are more conservative than in past years. Still, principals, teachers and staff were heavily represented at the briefing, and some questioned how many vacant seats actually are available at the best schools. And because school choices depend on past family experiences as well as test scores, a number of attendees despaired that perceived and actual improvements were equally hard fought goals. Parents and local school council members were in attendance, but discussion in breakout groups noted that relatively few parents or children were involved. And in a situation that calls for political solutions, there were no politicians.